Certification renewal occurs each fall. Beginning July 15, the MyAAFCS web portal technology will allow the convenience of accessing and paying renewal invoices online, or payments can be made by mail once you receive your paper invoice. Paper invoices are typically mailed at the end of August. Fee payments are due by October 1st to avoid assessment of a late fee. However, paying electronically before paper invoices are created/mailed will demonstrate “Save the Planet” and “Save AAFCS Resources” behavior! . Certification renewal is based upon payment of the maintenance fee (paid annually) and submission of 75 PDUs (reported at the end of the cycle). 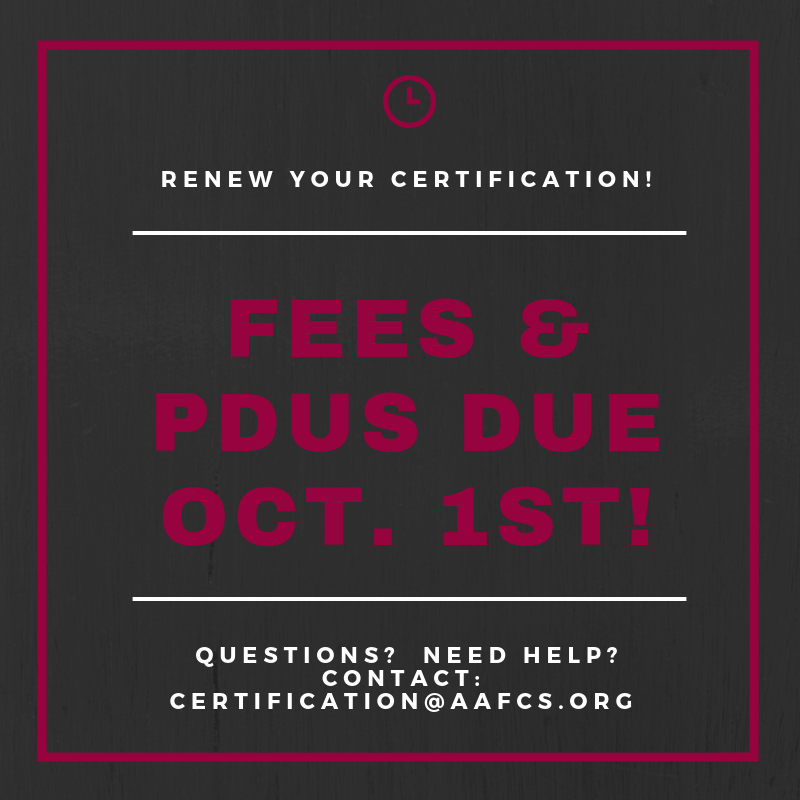 The due date for fee payment and PDUs is October 1st. PDU reporting is due for those whose 3-year certification cycle ends August 31 of the current year. To check your cycle dates and the number of PDUs recorded, please log into MyAAFCS using the instructions below. If you do not receive a notice regarding the annual maintenance fee or PDU reporting, it is likely that your fees are paid up and that PDUs are not due. If you believe that you should have received a notice, please log into the MyAAFCS portal and review your certification information or contact AAFCS Certification Office at 703-636-7641 or certification@aafcs.org. Those who meet the eligibility criteria and have requested a change to the "Retired" category for their CFCS credential are no longer required to report PDUs to maintain their certification. Please note that a change to "Retired" must be made in writing to the Credentialing office at AAFCS. The change is not automatic when one retires or moves to Emeritus membership. In the MyAAFCS web portal, click on the “Invoices (View, Pay, or Print)” menu button. Click on “Pay Open Invoices” to locate the invoice associated with certification fees. Check the box beside the certification fees invoice and click “Add to Shopping Cart.” Then, follow the instructions to pay via credit card (VISA, Discover, MasterCard, or American Express). For convenience, you may opt to use the recurring payment option. To do so, click the check box to “Save Payment Information” on the payment information screen. Payments should be made by October 1st. A late fee of $35 applies to payments submitted after that date. To access, choose "MyAAFCS Certification Portal" on the "Credentialing" menu on the navy navigation ribbon on the AAFCS website. You will be prompted to log into MyAAFCS and then directed to the Certification Portal. In the Certification portal, click on the “Professional Exams and Certifications” menu button. To report PDUs, click on the “PDU Reporting and Transcript” button. This screen shows the dates of your certification cycle, the list/status of PDUs reported, and the total PDUs earned, reported through online or hardcopy submission, and accepted as eligible credits in the current cycle. If this screen has no PDU activities listed, the Certification Office has no record of any PDUs reported during your current certification cycle. Follow the on-screen instructions to enter information and then click “Save” at the bottom of the screen. Please note: If you receive an error "feature not available" when saving, this is likely due to a description that is too long (over the maximum characters). Shorten the description and try again. When using the printed “PDU Reporting Form,” report PDU activities only once during the 3-year certification cycle when all 75 PDUs can be reported. PDUs for the certification cycle ending August 31 of this year are due October 1st. Thank you for your ongoing participation and support for YOUR national certification program. We appreciate your patience as AAFCS works to distribute the invoices and mailings in a timely manner!